Hi, Everyone. I know I have a small voice (because I`m a very small budgie), so I`ll try to speak up. I was found on the streets of San Francisco, sitting on the pavement by a kind lady. She thought I seemed too small, but she wasn`t sure what to do to help, so she took me to a vet, and the vet called Mickaboo. Like a lot of birds, I don`t feel comfortable eating alone -- how do I know it`s safe? So I was afraid to eat for a while. 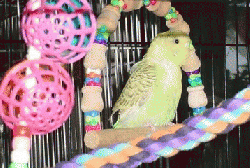 But now I`m in a Mickaboo foster home with LOTS of other budgies! It`s wonderful. And look at my new home -- there`s toys here and even more wonderful -- another little budgie! We are very happy to be together, and we`re both eating lots now, cuz we have company. So if anyone out there is looking for a great pair of companions, you should knock on our door. Mickaboo knows where we live.